When she’s not bubbling in Scantron sheets, Harini keeps herself busy with a wide range of activities. She’s deeply involved in community work; for example, she recently organized a fundraiser for Sankara Eye Foundation. She also volunteers to assist patients at Sutter Health and participates in MedShare, an organization that provides medical supplies for third world countries. And to top it off, she volunteers at her local library. On campus, she participates in DECA, a business club, CSF, a volunteering and scholarship association, and HOSA, which prepares students to be future health professionals. Her interests and activities suggest an attraction to the medical field, so it’s not surprising that Harini hopes to become a doctor or scientific researcher. “Physicians are in high demand currently and so many people around the world lack proper health care. I’d like to contribute to the reform of public health and help patients directly,” she said. “As a researcher, I’d like to explore the field of bioengineering or biomedicine to progress genetic modification and therapies as common treatment plans for conditions we deem terminal, like cancers.” Clearly, Harini has compassionate and ambitious goals. 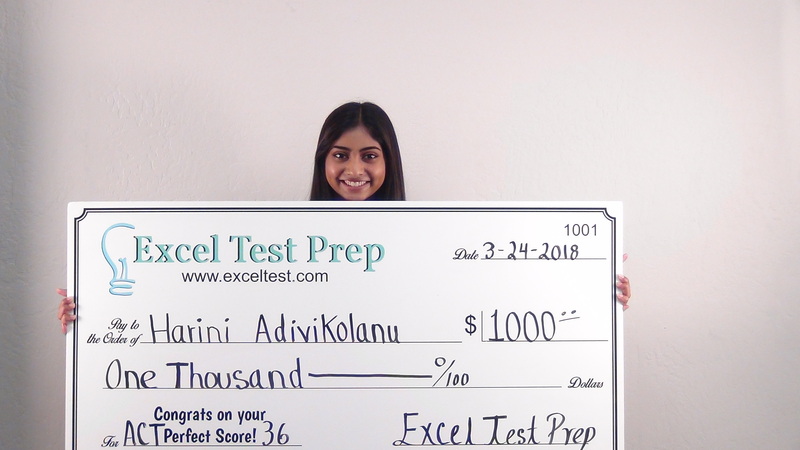 With her perfect ACT score, we here at Excel are confident that she’s well on her way to realizing them.